In Sam Mendes’ film Skyfall, Bond’s death and the loss of an important hard drive containing the identity of multiple covert agents creates a controversy between the Intelligence and Security Committee of Parliament and Britain’s secret intelligence MI6. While the committee believes that MI6 is antiquated, M posits that its use can only be observed by looking at a deeper level entirely. The “world of shadows” describes the world of Bond and all of the spies that he encounters; it contains individuals who are unknown and most importantly faceless. M says that battle must be done in this shadow world, but if these shadows lack identities, who is Bond chasing after and killing within the shade? 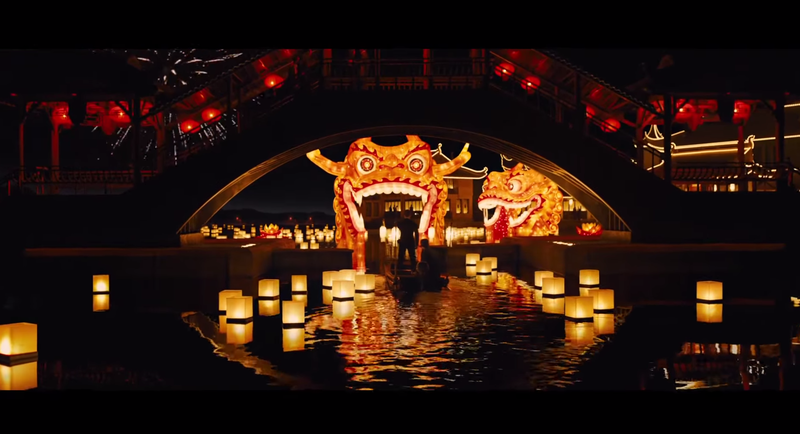 Sam Mendes uses a myriad of cinematographic techniques and dialogue in order to show us that James Bond throughout the movie is in fact constantly engaged in a battle with himself- continuously being killed and reincarnated as other agents in this realm of shadows. Moneypenny grits her teeth and fires, striking Bond in the chest, which sends him plummeting into the sea. 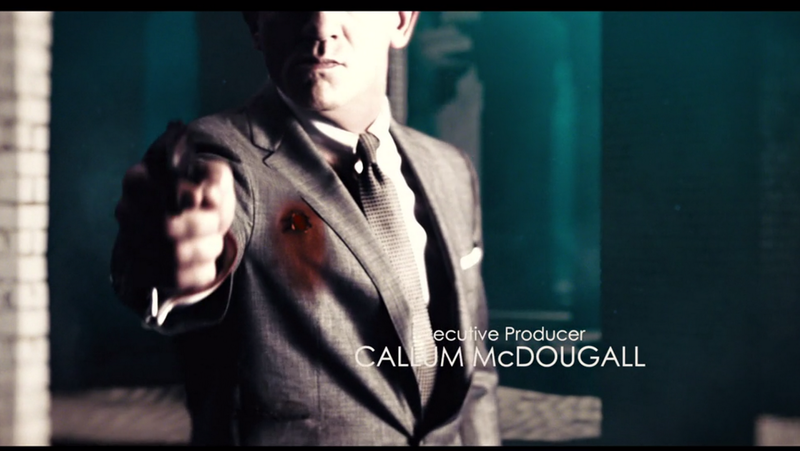 Similarly to Ronson, Bond is shot in the upper chest region, and “killed” by M. Mendes puts Ronson (a character who doesn’t have a single role plotwise) in the opening scene to establish a parallel between him and Bond, and introduce the theme of reincarnation that is hinted at throughout the movie. We are only able to see Patrice’s face after Bond exclaims that Ronson won’t make it because Ronson, who gets killed by Bond, reincarnates as Patrice in order avenge himself. However just as Ronson comes back to kill Bond , Bond comes back to kill Ronson (who is now Patrice) in a way analogous to how he was killed. If the opening act didn’t make his intentions clear, Mendes uses the credits to elucidate the motif of Bond continuously killing himself, by stylistically portraying it during his “death” underwater. During these credits there are two shots that are explicit in their nature. In the first Bond is shooting mirror images of himself, and in the second he is shooting his shadows that each react to being shot. These shadows refer to the enemies that M talks about in her speech. They are faceless, unknown, and are being killed by Bond who expresses sincere loyalty to M. Besides the fact that they are all Bond’s shadows, he shoots them all in the same place, which is (un)coincidentally the same place that both he and Ronson received their mortal injuries. When these pictures are read literally, Bond kills himself over and over again, and the bloodstain remains on his jacket to prove it. The next time we see Bond he is on a beach, and there is no attempt on the filmmaker’s behalf to indicate how he gets there. Mendes counts on the audience’s contextual understanding, and asks us to make a context-based inference. However, the Bond that the audience is seeing at this point is not the same Bond that fought on top of the train because that Bond never escapes the ocean. Mendes shows us that the Bond we are seeing is different from the previous one in a plethora of ways. When he returns to England and breaks into M’s flat the first thing we see is not Bond, but a silhouette of Bond that is shrouded by shadow. Mendes doesn’t do this to award him a grand entrance (as he flinches when M turns the lights on,) but he does it to show that visually, he is a “shadow” of his former self. While M trusts that James Bond is trustworthy because of his laurels, Mallory who has not encountered Bond before notices the differences between the man in front of him and the legend. He attributes this to old age, but in truth they are two different shadows with the same face. Before the new Bond confronts Patrice, there is a seemingly disjointed scene before hand where Bond is doing laps in a pool. Shortly after he gets a text with the whereabouts of Patrice, and follows him from the airport to his intended target. While Bond has multiple opportunities to kill Patrice before he murders most of the security within the building, he chooses not to. Instead, he follows Patrice and rides the elevator up with him (under the elevator hanging on to the bars) to a floor that takes an eternity to get to. Bond climbs up from the bottom of the elevator and opens the elevator doors to a room that is fluorescently lit blue. At this point we should start to realize why Mendes added the untimely pool scene before hand, and why they traveled so high on the elevator. When Bond enters the room, Patrice hears a noise and turns back. We get a shot from Patrice’s perspective, but the only thing that he can see is the holographic jellyfish covering Bond from plain sight. After Patrice takes out his mark, fighting ensues and while they are both only silhouettes, we can’t help feeling like we have seen this scene before. Finally Bond flips Patrice and he falls over the edge, only to be grabbed and suspended by Bond. While Bond is asking him questions pertaining to the drive, Bond inadvertently drops Patrice and he falls thousands of feet into the abyss. Mendes adds the pool scene to renovate the underwater motif that was so prevalent at the start of the film. Even though Bond could’ve killed Patrice, or at least injure him multiple times before getting to the top, he cannot because the setting isn’t right yet. Mendes has Bond accidentally drop Patrice in order to create a parallel between this scene and the opening one. 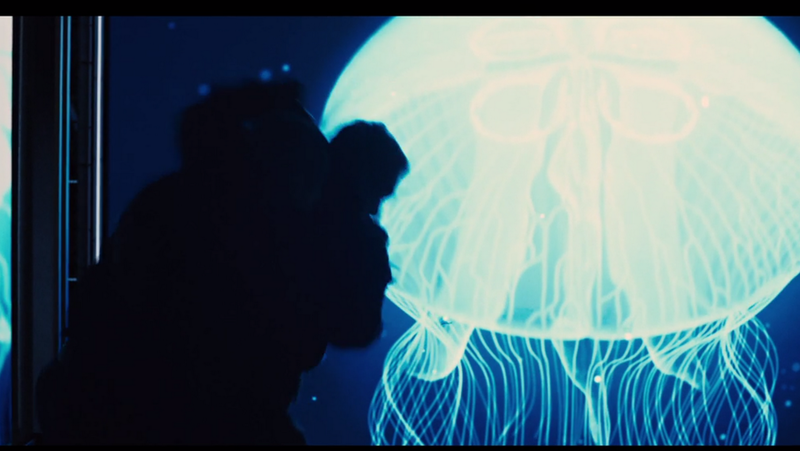 The room with the moving jellyfish represents the ocean that the old Bond initially died in, and the reason they’re on such a high floor is so that Patrice can fall for an incredible duration. Mendes takes the old scene and flips it, having Patrice fall from the ocean and into the sky. Mendes chooses Moneypenny to shave Bond because the audience knows she has killed him before. When Bond tells Moneypenny that sometimes he prefers the old ways, and she responds by saying the old ways are better, they are both referring to the old Bond who died in the ocean. Bond gives her the razor and puts his life in her hands again, but both Bond and the audience know how that scenario played out the first time. Bond entrusts her to kill him because he knows that once he killed Patrice, Patrice will be resurrected as the old Bond – which also implies that Bond displays a medium awareness that breaks the fourth wall. However in order for him to reappear, the new Bond must “die” first. a death always occurs before a new agent appears, and only two agents can be in play at the same time. another comment on the old Bond’s revival and Mendes’s structure. By Mendes’ rules, we know that one more reincarnation has to take place and since the main antagonist is the only prime character who we have yet to see, we know that the new Bond will become Silva. The new Bond dies in his penthouse suite in Macau, and so it is fitting that Silva in his first scene descends from up above in an elevator, wearing a black and white suit with the colors inverted with respect to the old Bond. He is indeed an old dog with new tricks, and the audience learns that he was M’s favorite agent from 1986 to 1997. His technological prowess is unmatched, and the equipment in the room that he arrives in looks like it belongs in a UFO. When speaking to Bond he communicates his disdain for M, something that the old Bond did while in her flat for killing his old self as well as Ronson. Silva’s grandmother of course represents M, and the rat infestation on the island refers to the faceless shadows (agents) that M speaks about in her speech to Parliament. The rat’s cannibalism refers to Bond’s continuous suicide, and since there are no more characters to cycle through, he and Silva are the only rats left. Silva tries to explain this vicious cycle to Bond in order to enlighten him, and make him see that M was behind the killings every time. M ordered Bond to leave Bronson to die, M made Moneypenny shoot Bond, M sends Bond to kill Patrice, and now M is ordering him to kill Silva. No one in the world of shadows is safe from M’s wrath, and Silva is just trying to break the vicious cycle that M has created. While she is quoting Ulysses both Bond and Silva are given screen time, both moving towards the same target with opposite intentions. Mendes chose this quote because it applies to both Bond and Silva; old dogs who refuse to yield. While Bond wears his iconic suit, Silva wears a police uniform, embodying justice, with his bullets as verdict–only after he has asked her to think on her sins.